A year after Protective Edge, which Israel won militarily but lost PR-wise, evidence surfaces of a particularly cynical Hamas stunt. 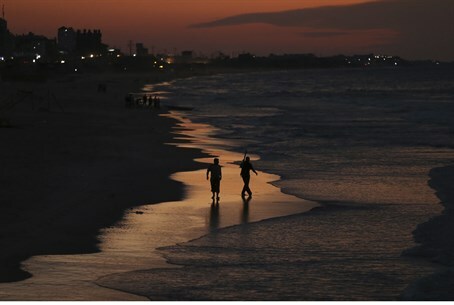 One of the incidents most widely disseminated as "proof" of Israeli war crimes during its defensive Operation Protective Edge in Gaza last year was the deaths of four Arab youths on a Gaza beachfront used exclusively by Hamas terrorists. Foreign journalists reported as fact that Israeli war planes had bombed a beachfront, killing four youths – and the incident was highlighted in the recent UN Human Rights Council Commission of Inquiry. The Commission's report blamed Israel for failing "to take all feasible measures to avoid or at least minimize incidental harm to civilians," questioned the "urgency" of the attack in the first place, and blamed Israel for prematurely closing its investigation into the incident after having found no fault in IDF actions. At the time, Israel's "defense" was that incidents of this nature were to be attributed to the Hamas practice of "acting from places where the maximum civilians would be harmed," in the words of a National Security Studies Institute researcher cited in the report. However, it now appears that Israel need not take any approach to defend its actions - as the children on the beach were apparently killed not by its forces, but by Hamas itself. The evidence for such has been gathered by a US-based weapons expert named Thomas Wictor. After conducting a forensic analysis of what happened on the day, pieced together using Hamas propaganda footage, film from various international TV networks, and photographs, Wictor has concluded that the boys killed on the beach were murdered by Hamas in a “Pallywood-style” propaganda stunt. Partly based on the fact that the many photographs of the dead boys curiously showed no bleeding, Wictor says that they were probably executed by Hamas the day before and that the corpses were then blown up in a Hamas-arranged explosion the next day. EJP reports that this is one of many clues leading Wictor to infer that the bodies were placed there later, after the beach had been cleared by many Hamas operatives stage-managing the stunt and distracting the press. Several of them are clearly visible in the footage, including a man in a purple shirt who appears to be in charge of the operation.